October 4th, 1957 marks time as one of the most pivotal days in modern history. At exactly 19:28 GMT the earth rumbled underfoot as a boiling column of smoke pierced the atmosphere and entered the inky blackness beyond. The moments that followed this raucous exhibition culminated in a prolonged moment of silence. With the world hushed in anticipation, the bulk of aluminum, steel and vacuum tubes at the leading edge of that column of smoke returned a curious and almost obnoxious series of beeps. Sputnik, the world’s first satellite, had successfully transmitted a radio signal back to Earth. Much has transpired since then, and there are now several thousand active satellites in orbit. They are the silent custodians of the planet’s semi-celestial digital data, and provide us with the GPS, weather, and communication signals we use on a daily basis. For the overlander, these services keep us on course, in touch, and most importantly, within reach of lifesaving rescue resources. Emergency satellite communications are nothing new, but it’s only recently that these tools have been within reach of the average traveler. As of late, the market has exploded with an array of options, but which device is best for your individual needs? Within the realm of emergency communicators for land travel, there are but two distinctive options: the Personal Locator Beacon (PLB), and newer-to-the-market variants of Satellite Emergency Notification Devices (SEND). A PLB is a serious piece of hardware with a single primary function—to summon search and rescue (SAR) resources from anywhere in the world. A PLB is defined by the frequency of the distress signal it transmits (406 MHz). which is the Mayday signal employed by the Cospas-Sarsat emergency response system. Cospas-Sarsat, a joint project between the United States and the Soviet Union, became operational in 1985. Canada and France joined in 1988, and the network now has ground-segment providers in more than two-dozen countries. At the center of the Cospas-Sarsat network is a dual layer of geostationary satellites; the outer layer positioned 22,000 miles above Earth, and the second layer, or Low Earth Orbit (LEO) satellites, just 500 miles overhead. Augmenting the network is an extensive collection of ground stations called Local User Terminals (LUTs). Combined, they provide complete coverage of the Earth’s surface. Additionally, NOAA weather satellites carry necessary equipment to relay Cospas-Sarsat 406 MHz distress signals. When a PLB is activated it puts into motion a complex series of communications. After the unit establishes lat/lon coordinates it transmits a data “package” to Cospas-Sarsat, which in turn sends the signal to Earth via LUTs. The package also includes the PLB’s identification number and registration information, thus informing the system of who you are. The data package is then directed to the SAR resources best equipped to help, which in the U.S. is the Coast Guard and Air Force. In short, a PLB is purpose-built to access government-operated rescue services around the world. To date, more than 30,000 successful rescues are attributed to the efficiency of the Cospas-Sarsat system. Chances are that by the time you’re done reading this issue of Overland Journal, another rescue will have been added to that number. As the acronym implies, a Satellite Emergency Notification Device is first and foremost a rescue tool. Unlike a PLB, a SEND uses a proprietary signal, rather than the 406 MHz rescue-specific frequency, and is capable of sending and receiving messages to a variety of user-directed recipients. As an added bonus, a SEND can be used as a non-emergency communicator to receive weather alerts, provide real time tracking data, and even post messages to social media. And SENDs can do so from the far corners of the Earth. Any satellite-based system is only as good as the satellites that support it. Two of the devices tested here communicate with the highly regarded Iridium satellite constellation. The Iridium network consists of 66 LEO satellites, each of which is capable of covering a section of the Earth’s surface up to 2,800 miles in diameter. Designed with a degree of overlap, the Iridium coverage is complete, and includes both poles . (An independent third-party study by Frost and Sullivan determined the Iridium network to be most reliable.) 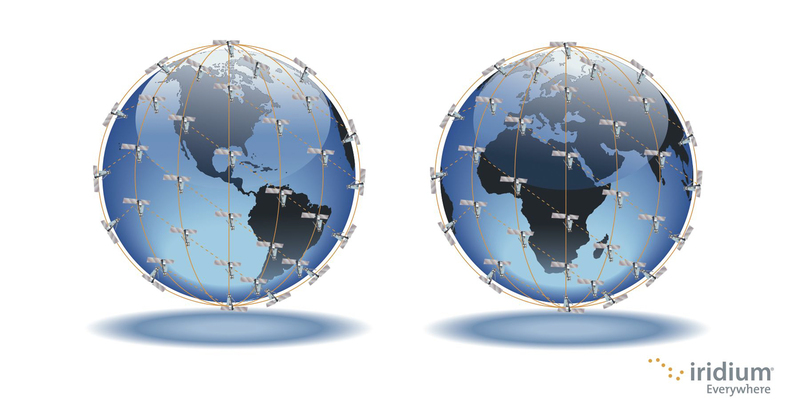 SPOT, a subsidiary of Globalstar, a satellite communications company, uses their own extensive network of satellites. Because SEND units do not use the 406 MHz frequency, distress calls are routed to a third party, an International Emergency Response Coordination Center (IERCC). One such IERCC is Texas-based GEOS. GEOS is an impressive commercial enterprise housed in a self-sufficient bunker built 50 feet below ground. It is the world’s first such center and claims more than 2,000 successful rescues for SEND-originated distress calls; most via SPOT devices. The streaming of information for a SEND-originated distress call is similar to a PLB; the unit transmits a data packet with GPS coordinates with an accompanying SOS message to the satellite network, which bounces it back to GEOS via ground antennas. From there, preliminary rescue procedures are initiated. If the SEND unit permits two-way communications, GEOS will remain in contact with the user, SAR teams, and emergency contacts until a resolution is confirmed. Interestingly, GEOS offers rescue insurance through Lloyd’s of London for a very reasonable fee. Which type of device to add to your kit is a matter of assessing how likely it is you’ll need a genuine rescue, and whether or not having non-emergency messaging is important. A PLB is the type of device that hopefully will never need to be put to use. A SEND, on the other hand, might be used daily to communicate to contacts back at home. It’s up to the user to decide which will provide the most utility, and ultimately, the most security. Obviously, testing a PLB is not really in the cards. The last thing we would want to do is push the help button and wait for the rescue cavalcade to pop over the hill. As such, we were only able to test the “self test” features of the PLBs in this review. We did however fully test and evaluate the communication features of the SEND units. People often ask why we choose to review certain products and not others. For this test the common denominator was the ability to summon a life saving rescue. Second to that, it was important that every device be able to perform that task as a stand-alone unit. 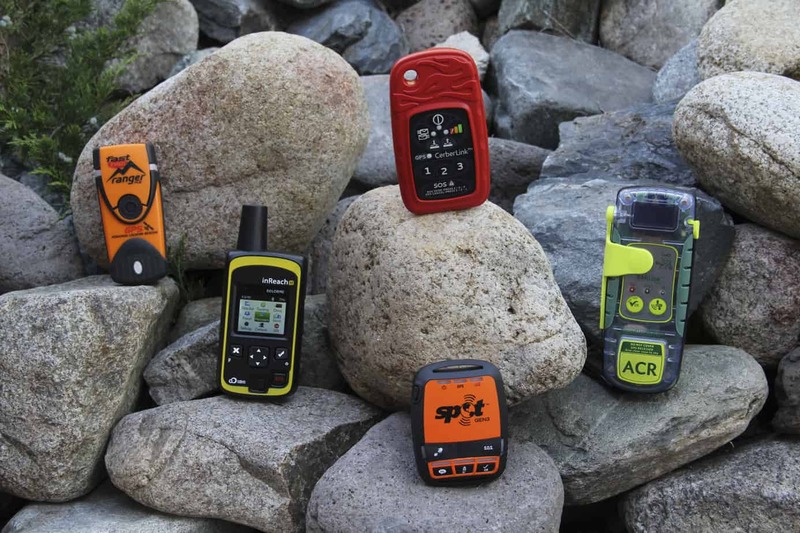 We could have included other offerings like the SPOT Connect, or the DeLorme inReach Smartphone, but some of their features would have been redundant. What we present in this review is a blend of time-tested products positioned against cutting edge new releases. The SARLink View is the type of device you would expect from the experts at ACR. With more than 54 years designing and manufacturing the world’s most advanced emergency electronics for marine, land, and military applications, the SARLink View is reassuring from the minute you remove it from the box. A true PLB, it has robust construction and a simplified interface befitting a device used only in emergencies. The SarLink View has a 66-channel GPS receiver that the company claims is the most sensitive in its class. It can pinpoint your location within 300 feet and relay those coordinates to the Cospas-Sarsat network. The 406 MHz signal is transmitted at a powerful 6.3 watts and carries with it a unique identification number informing SAR who and where you are. A secondary transmission broadcast at 121.5 MHz serves as a homing signal to guide rescuers directly to you. To aid in low-light situations, an LED strobe provides visual confirmation of your position, and the internal lithium battery will sustain a signal for up to 30 hours. Unique to the SARLink is a digital screen that displays current longitude and latitude, necessary prompts, and confirms the status of the distress call. There’s no second-guessing that a Mayday signal has been received. Designed primarily to summon emergency services, it does have a limited ability to send messages, though this feature is so constrained it’s almost a non-starter. Common amongst PLB units, there is a self-test mode to ensure it is in functioning order. For an annual fee of $60, that test signal can include a prewritten text message. (Most often, “I’m okay,” is chosen.) Unfortunately, the text can only be submitted 60 times during the lifespan of the battery, and only in North and South America. Those limitations make the SARLink View a less than optimal messenger. However, because the subscription is not required, the SARLink View may be the ideal tool for anyone simply looking for the security of a push-of-a-button rescue device. Once the decision is made to activate, the user simply deploys the flexible metal antenna and presses the red emergency button. McMurdo has been producing marine safety products since the 1940s and entered the locater beacon market with a Cospas-Sarsat approved device in 1989. Two decades later, their Fast Find family of beacons has set new standards for size and capability, and opened the door for the highly regarded Ranger. 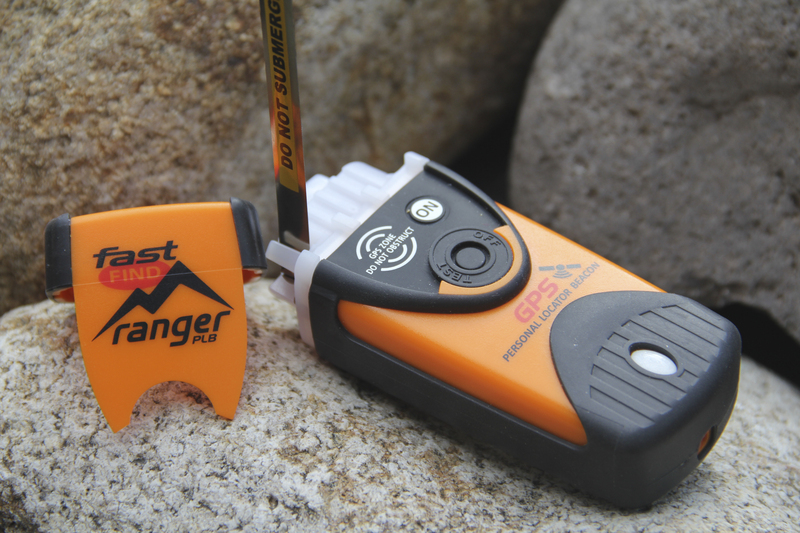 Released in May of 2012, the Ranger is one of the most rugged and compact PLBs on the market. Though the Ranger is pocket-sized, it doesn’t skimp on features. Central to Ranger’s identity is its dedicated 406 MHz distress signal. With global Cospas-Sarsat coverage, it is a solid option for the international traveler. 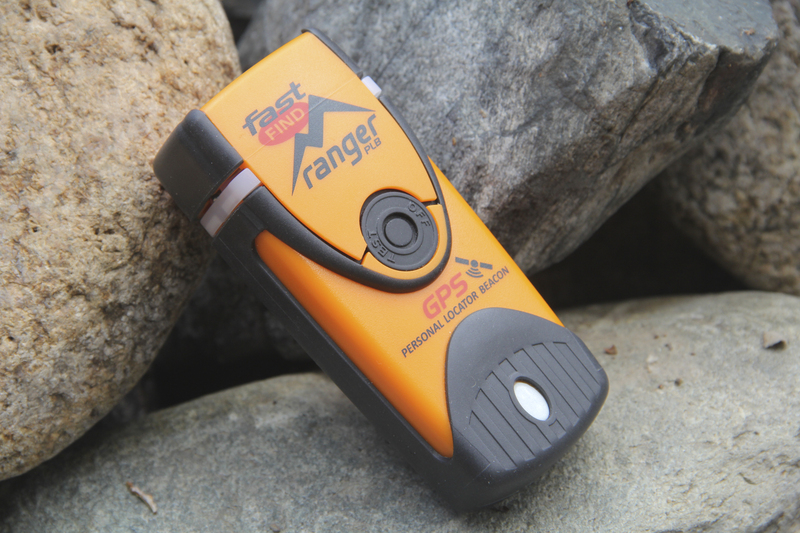 The Ranger has a 50-channel GPS receiver, which McMurdo claims is accurate to within 62 feet. As with the ACR, it will transmit lat/lon coordinates along with the registered owner’s unique user information. 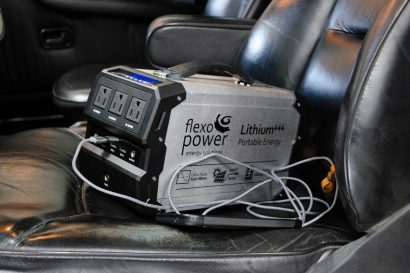 The unit’s lithium-manganese battery will maintain a steady transmission at a maximum of 5 watts for up to 35 hours and has a 6-year shelf life. 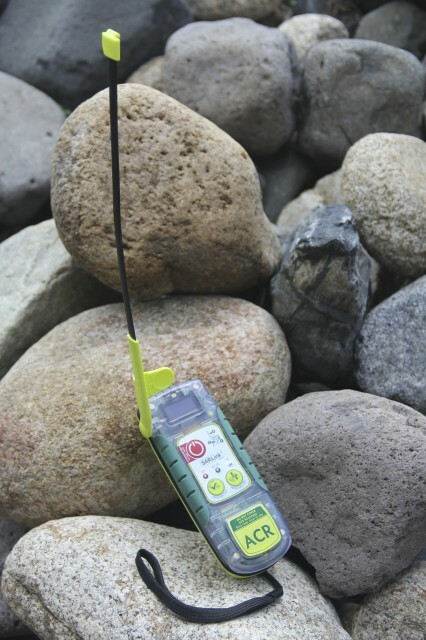 It also features a 121.5 MHz homing transmission, allowing first responders to quickly locate the user. When activated, a bright LED strobes in the SOS Morse code sequence. For its diminutive size the Ranger is stout and solid. It’s waterproof to 30 feet and the rubberized exterior has a good feel; ready for the hard knocks that accompany most remote adventures. With any PLB, the possibility of a false alert is always a concern. Though it seems incredulous that anyone would be so careless, it does happen. During this review a visitor at my office turned to me with a blinking PLB in hand and casually asked, “How do you turn this off?” That person is now required to keep their hands in their pockets when they visit. 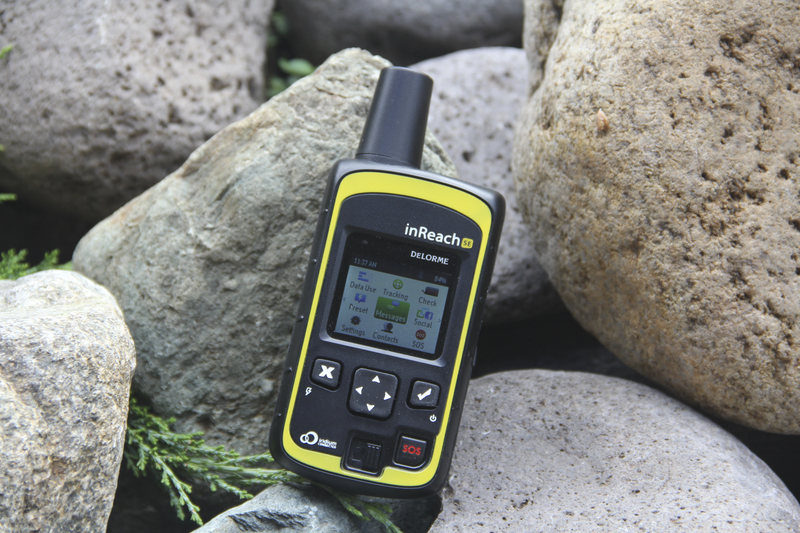 Launched in April of last year, the inReach SE is the newest device in this review. Based on DeLorme’s highly successful inReach smartphone communicator, the SE can be paired with a smartphone or tablet. However, it works equally well as a stand-alone unit. To achieve that end, the inReach SE features a color display and enhanced user interface. The result is a tool capable of sending and receiving messages from anywhere in the world. 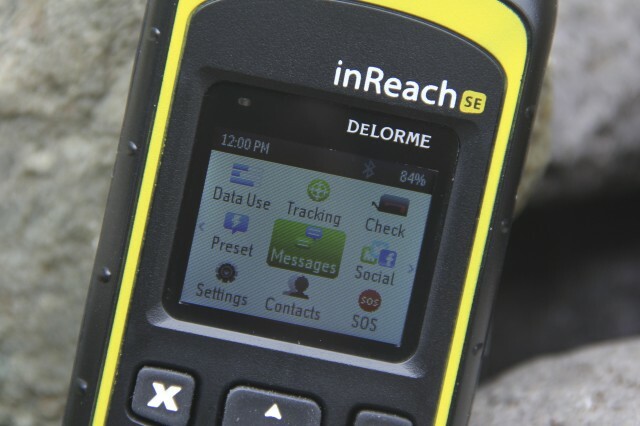 To maximize the utility of the inReach SE, DeLorme made the wise decision to plug into the Iridium network. With global coverage, there isn’t a corner of our blue sphere where the inReach SE will be in the dark. 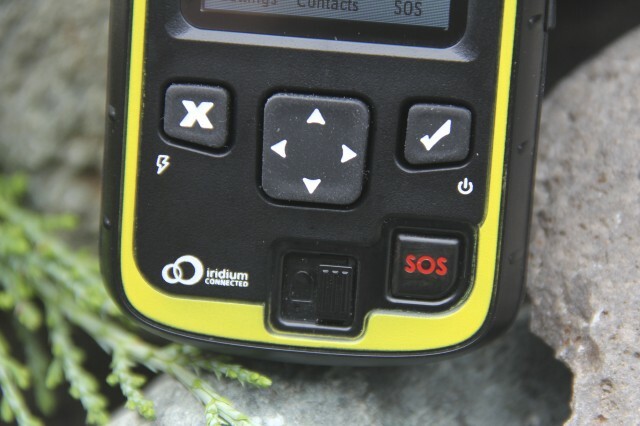 Though it has more external controls than other units in the test, the most important is the SOS button on the lower left. Protected by a secondary locking switch, the SOS button transmits a distress call to the GEOS emergency response center in Texas, USA. From there, preliminary communications are initiated and if needed, the dispatch of professional rescue services. The advantage of two-way communication is the ability to maintain dialogue regarding injuries and conditions. This type of information can make the difference between a successful or failed rescue. Although the inReach SE is more than capable of calling in a rescue, its most impressive features fall squarely within the realm of two-way messaging. Many users will quickly gravitate towards its intuitive Short Message Service (SMS) feature. These brief memos, which are limited to 160 characters, have become indispensable tools for keeping families and friends connected. With 8.6 trillion messages sent worldwide each year, if you’re not currently using text messaging, you’re a part of a shrinking minority. Other devices have offered this feature in years past, namely the DeLorme inReach Smartphone, but it only worked when the unit was paired to a mobile device via a Bluetooth signal─the inReach SE is fully functioning and stand-alone in this capacity. 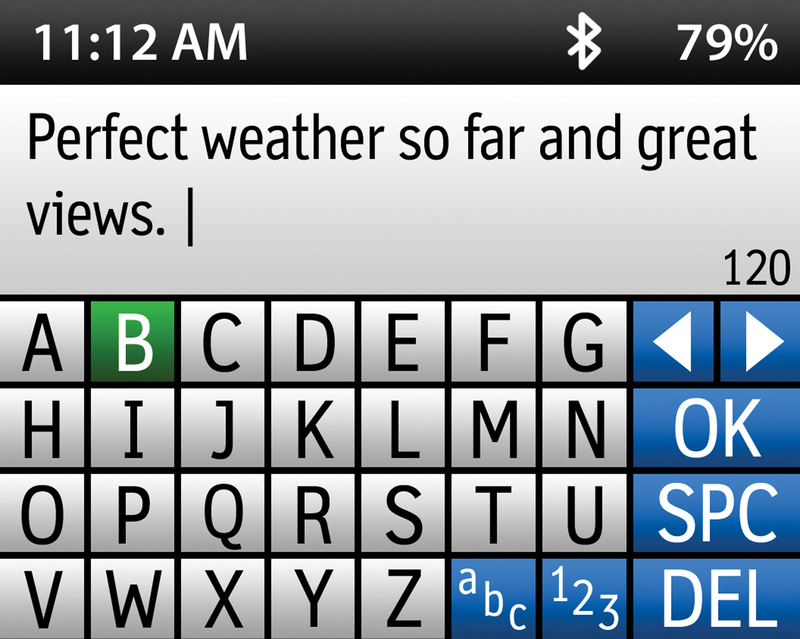 Composing an SMS message is facilitated with the unit’s virtual keyboard. Although the buttons have a tactile feel and the display is bright and easy to read, virtual keyboards of any kind are slow and awkward. To streamline messaging, the unit can store multiple, user-generated preset messages. Additionally, any messages received on a paired smartphone will be accompanied by a hyperlink. The hyperlink will open a map page on the DeLorme Enterprise website showing the exact location at the time the message was sent. Messaging with a paired smartphone is quick and easy. Simply pull a recipient from your contact list, compose your message, and press send. This feature effectively turbo charges your smartphone. Additionally, when using DeLorme’s free Earthmate app, you can download topographical maps and National Oceanic and Atmospheric Administration (NOAA) charts, and data will be automatically transferred from the inReach SE to your smartphone. Users can then view their precise location, elevation, speed, and course. You can even initiate an SOS signal from your linked smartphone. In short, Earthmate is one of the best mobile apps we’ve used. To most efficiently manage the unit’s complex features and to augment the tools provided by the Earthmate, DeLorme created the Explore DeLorme website, which provides users with a place to manage subscription options, organize contact lists, compose preset messages, view maps and tracks, and a host of other helpful services. In evaluating the inReach SE simply as a piece of hardware, I can say it’s well designed and heartily constructed. The sturdy case is dustproof, submersible to 30 feet for up to 48 hours, and the internal lithium battery will maintain a 100-hour charge. Editor’s Note: The latest iteration of the inReach is the Exporer which goes a step beyond the SE and adds a digital compass, barometric altimeter and the addition of map and navigational features. Able to import GPX files, it is closing the gap on an all-in-one device. In 2007, SPOT single-handedly brought satellite messaging and SOS signaling to the masses. Their debut product, the SPOT Personal Tracker, quickly sold by the thousands, due largely to its reasonable cost and affordable subscription plans. 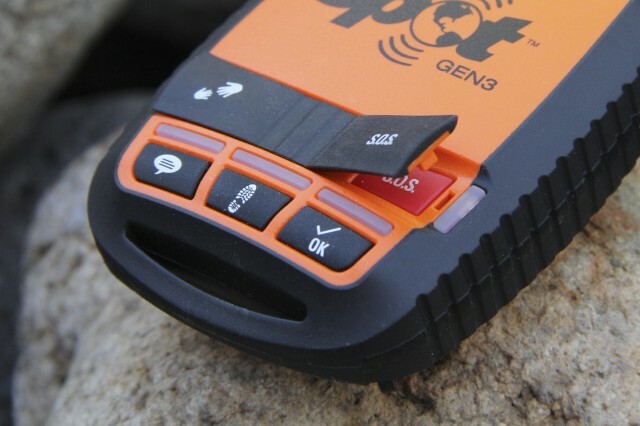 In the past six years since they’ve introduced a number of products including their own SPOT satellite phone, and their latest offering is the SPOT Gen3. 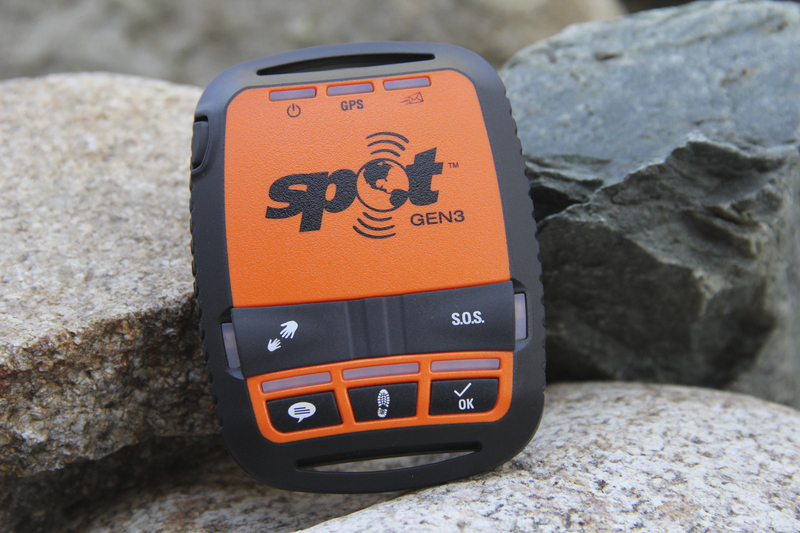 With a price point of just $169 the SPOT Gen3 is one of the most affordable satellite communicators on the market (though an annual subscription of $100 to $150 is required). If it hails from the same genetic fiver as the SPOT Messenger, there is little doubt this new iteration will be equally well received. Though the Gen3 is only capable of sending prewritten communiqués (as a stand-alone unit), it doesn’t detract from its utility. As a subsidiary of Globalstar, SPOT devices rely on their own network of LEO satellites to relay communications. 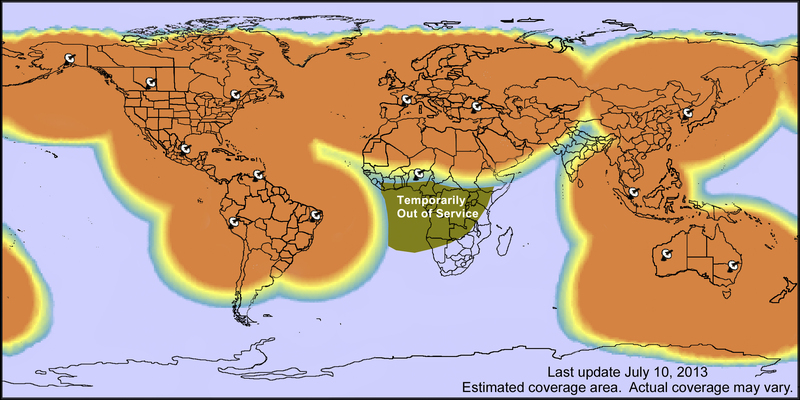 Unlike the Cospas-Sarsat and Iridium satellite networks which provide signal coverage over the entire planet, the Globalstar constellation has some regrettable coverage gaps: there is no coverage in sub-Saharan Africa, service is compromised in the Indian subcontinent, and signal strength in Russia is degraded. Additionally, small regions of South America, Southeast Asia, and the world’s oceans may also have challenged reception (not that oceans pertain to the overlander). While it’s safe to say many of us will not be impacted by these coverage limitations, they are worth researching before making a final purchase. Sometimes the most reassuring communication is not the message sent, but the message received. For those at home, an “OK” is more than enough to ease worried minds. Pressing the OK button sends a prewritten SMS or email, again accompanied by exact coordinates, to preselected personal contacts. To augment the OK communication, there is a third Message button that sends a prewritten SMS or email to personal contacts. Having used the SPOT GPS Satellite Messenger for a couple years now, I use that button often to communicate to my wife, “All is okay; running late.” (I daresay I use that feature more than I should.) Lastly, in our age of immediate experience sharing, these messages can also be pushed to Facebook and Twitter. Sometimes sending a message isn’t necessary for those tracking you at home. With the tracking feature activated, the Gen3 will transmit your location in real time, in intervals ranging from 2.5 minutes to an hour, to Google Maps™ or the SPOT Adventures website. The unit also has a built-in motion sensor to facilitate Motion Activated Tracking. During your journey, should you become incapacitated and unable to push the Help or SOS buttons, your contacts at home will have a solid fix on your last-known location. To manage all of these messages and complex services, SPOT has created an intuitive and feature-rich website where users can purchase subscription plans, add contacts, connect to social networks, view current and previous tracks, and compose important prewritten messages. It’s an excellent interface to help maximize the potential of the device. 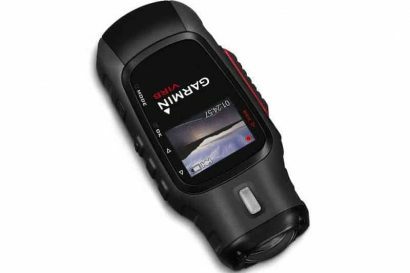 The Gen3 has an updated waterproof and dustproof case, a more compact size, and easier to use buttons. The new battery configuration permits the use of four AAA NiMH batteries, which can be recharged via a USB cable, and SPOT claims battery life to be twice that of its predecessor. The user interface is made up of multiple LEDs. One LED indicates the unit’s satellites signal strength, another reports the status of outgoing messages. It’s not terribly complicated once you get the hang of it, and understanding these functions in advance is important. For those concerned with the prospect of false alerts, the Help and SOS buttons are protected behind plastic covers. As is the case with McMurdo and ACR, Briartek entered the consumer market by way of marine electronics. The CerberLink, combined with Briartek’s CerberCenter website and CerberTouch mobile app, becomes a three-part system dubbed “Cerberus.” This is the same moniker shared by the mythical three-headed dog that guarded the gates of Hades. If you think that’s a head scratcher, wait until you start thumbing through the extensive instruction manual. The CerberLink, which works off the Iridium network of satellites, is the most complex, system in this review. As a stand-alone unit it has the ability to send a few prewritten SMS messages as well as a distress call. It can be activated manually to initiate a tracking feature, and gives feedback on battery life and satellite signal strength. It has a few more features than the SPOT 3 device─However, when paired to a smartphone via the CerberTouch mobile app, the CerberLink can perform enough tricks to make your head spin. 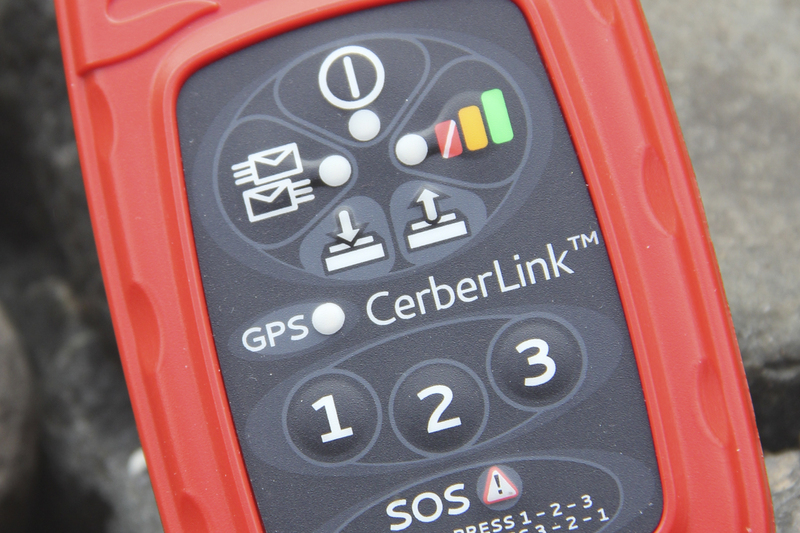 Though the common denominator for all other devices in this review is the ability to transmit a distress call, whether on the GEOS or Cospas-Sarsat, the CerberLink SOS signal communicates directly to no one. At least not out of the box. However, this should not be construed as a strike against it. If anything, this gives users the freedom to select, in advance, whom they feel is most capable of responding to their own unique predicament. This could be personal contacts, park rangers, local SAR teams, or a third-party commercial response center such as GEOS. For example, let’s say a user opts to have their SOS message go to a personal contact. When the signal is detected by Cerberus, their team will make sure the emergency contact is contacted and begin monitoring communications. They can also open a two-way communication with the user if needed. However, as the Cerberus team is quick to point out, they are not an emergency response center—so emergency contacts should be selected with great care. While I wouldn’t discount the CerberLink as a rescue tool, I would say it’s better suited to facilitate peer-to-peer communications. Because the unit lacks a display or any means of data entry, it’s highly dependent on a paired smartphone as the principle interface. Though this creates a level of technical duplicity worthy of consideration, the CerberTouch app elevates the CerberLink to the level of a super communicator with a full keyboard, vibrant color display, and a list of features as long as your arm. It would be challenging to convey all of its features in this short review, but there are a few worth noting. The “Breadcrumbing” feature, which can be set to intervals ranging from 10 minutes to 3 hours, allows users to mark given locations with a coordinate and time stamp. Those locations can be combined with an SMS message and shared on Google Maps™. Breadcrumbs tracks can also be posted on the CerberCenter website or shared on Facebook and Twitter. As a messenger the system can send an SMS, generated via a paired cell phone, to the satellite network. Another unique feature, and one that may catch the ear of some overlanders, is the ability to receive critical alerts. These notices, dispatched by NOAA and the U.S. State Department, can keep users apprised of natural or political storms which may be heading their way. The unit is waterproof and appears to be well constructed. It has a good feel and seems to be designed to endure the rigors of serious travel. Depending on usage level and satellite signal strength, battery life could range from 5 to 21 days. The company claims the battery’s standby time is 60 days, though we did not have the unit long enough to test this. As a stand-alone device, input commands are facilitated with the peculiar three-key number pad. This requires the user to remember a variety of codes to initiate certain functions (bear with me on this): Sending the SOS requires an easy-to-remember 1-2-3 code (the SOS is sent in 30 seconds), canceling an SOS is 3-2-1, initiating tracking is 3-1-2 (for 10-minute intervals) or 3-2-3 (for 3-hour intervals), and the Breadcrumb feature code is 2-2-2. Then there is a barrage of LED signals: flashing red for this, solid green for that. From a user’s point of view I can’t help but hope future variations will be easier to set up, learn, and put to use. It’s amazing to think that this category of products and the technology that supports it didn’t exist a decade ago. The concept of a GPS enabled PLB or SEND fell into the realm of science fiction rather than consumer electronics. Today, technology is advancing so rapidly that we had to delay this review to align with the release dates of emerging devices. The impressive inReach SE just hit the market in April, and the highly anticipated Pieps Global Finder, whose release has been delayed twice, missed our review window entirely. 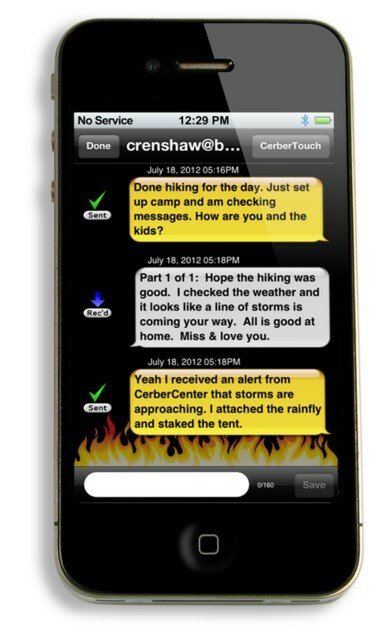 The newest player, the CerberLink, introduces communication features we never would have imagined possible just a year ago. Despite being so fresh to the market, the SPOT Gen3 is built on a proven platform many of us have trusted for several years. The updates to the Gen3 are not just cosmetic, but a true improvement to the GPS Satellite Messenger. 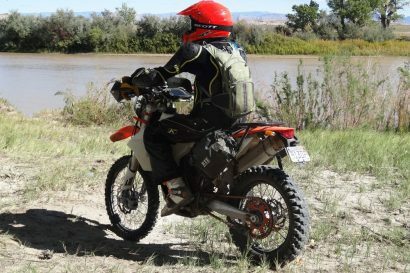 Given how well SPOT devices have served those of us on the Overland Journal team, it would be hard to not give the Spot Gen3 a solid thumbs up. The CerberLink deserves recognition as an ambitious first step in what will clearly be a revolutionary journey for Briartek. While there may be a few aspects of the Cerberus experience in need of refinement, it’s clear that Briartek has a vision, and they’re a brand to watch. If two-way communications factor heavily into your travels, the Cerberus is worth a close look. 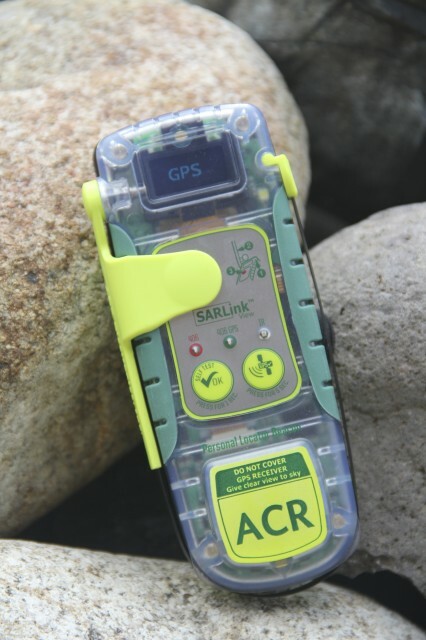 The ACR SARLink View and Fast Find Ranger may lack some of the complex messaging features of the SEND devices we evaluated, but they’re supremely reliable and could save your life. 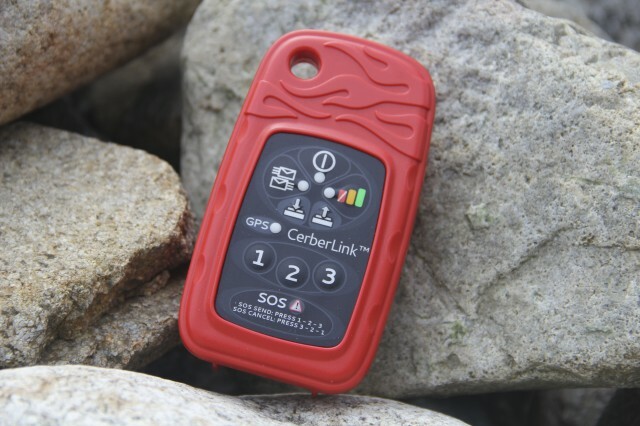 Not every traveler needs messaging capabilities, and these two devices add the security of rescue at the push of a button. Though the Fast Find Ranger is not the least expensive unit in the review, based on its function as a PLB, and the fact that no subscription is required (which could save hundreds of dollars over the life of the unit), we tip our Value Award hat to McMurdo. 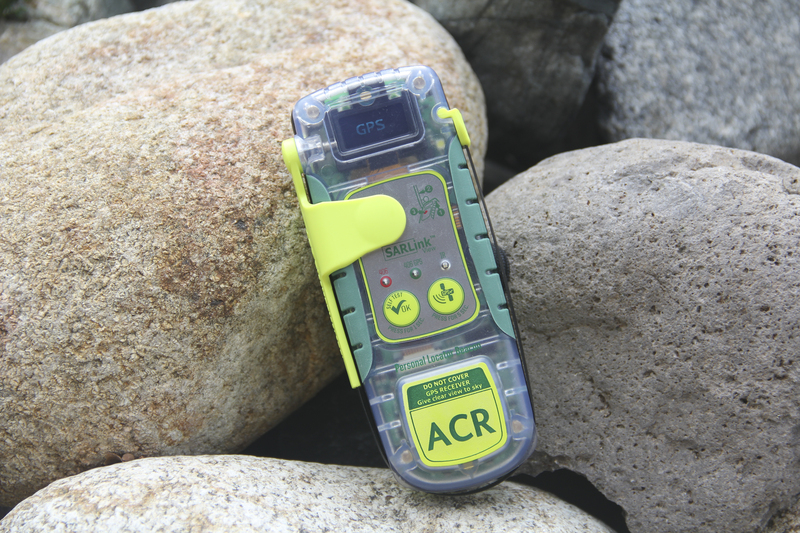 The DeLorme inReach SE warrants the Editor’s Choice award for a number of reasons. Pairing the global coverage of the Iridium network to the proven rescue efficiency of GEOS is a powerful combination. Toss in the ability to send and receive two-way messages and you have a formidable communicator. At half the cost of most smartphones, the inReach packs in a lot of technology for an unheard of price. By law, owners of PLB units are required to register their devices with the International Beacon Registration Database. This registration process attaches individual user data and emergency contact information to that particular PLB. When Cospas-Sarsat receives a distress signal, they initiate rescue proceedings by first calling the emergency contacts associated with that device. Failure to register a PLB can delay or complicate a rescue.